Ustad Bade Ghulam Ali Khan can be described as an artist who has had the maximum impact on the 20th Century Hindustani Classical Music scenario. Born in 1902 into a great musical lineage from Kasur in the Western Punjab, this great savant amalgamated the best of four traditions, his own Patiala – Kasur style, sculpturesque Behram Khani elements of Dhrupad, the intricate gyrations of Jaipur and finally the robust behlavas (embellishments) of Gwalior. But what actually characterised Bade Ghulam Ali Khan was an effervescent melodic quality which was concertised in a masterly flow of ideas which were delivered with a unique sense of alacrity, aided by one of the most pliable and dextrous voices ever heard in living memory in this land. Bade Ghulam Ali Khan had a relatively short career span. He blazed the trails of Calcutta in 1938 and in the 1944 All India Music Conference in Bombay, was virtually anointed Lord of all he surveyed in the field of Indian Music. But 24 years later, he was dead, prematurely at 66, having given the World less of himself than it would have wished to have. The maestro’s approach to khayal was essentially traditional – as seen in the medium pace of his vilambit Khayal presentation and his style of straightforward sthaibharana avoiding permutations. 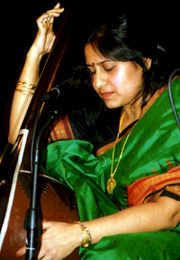 The character of his Gayaki was derived from an inclination towards looking beyond the traditional method of intoning a Swara to discover unchartered facets of beauteous melody, often achieved by very subtle inflexions of notes. This approach was bom of a mind which always strove to find that beauty in Indian Music which went beyond the Raga itself. For Bade Ghulam Ali Khan, ‘Taleem’ was but a means to a greater end where sheer melody and freedom of movement became unified His music was the joyous expression of an unfettered musical psyche. In ‘Thumri’, Bade Ghulam Ali Khan looked beyond the tradition of bol-banav where verbal and musical expressions are unified. He saw in Thumri an avenue for playing with notes with even greater abandon than was possible in the raga-restrained Khayal. From this perspective was born the now well-established Punjab-ang of Thumri. She was the last of an era that was. Zarina Begum was once the star attraction at royal mehfils and marriages, singing thumris, dadras and ghazals. Today, she wonders where her patrons have gone? Khush hoon ki mera husn-e-talab kaam to aaya, Khaali hi sahi meri taraf jaam to aaya…The sound of her captivating voice draws you up a narrow staircase, wide enough for just one person, broken at places, to reach her abode. There is nothing in the impoverished surroundings of that one-room hovel to indicate that it has ever seen better days. But Zarina Begum, now nearly ninety, has. Among the last of Lucknow’s famous mehfil singers, she retains all the graces of a Lakhnavi courtesan as she sits up with a scowl on her face, straightens her khizab-dyed hair and arches a brow to question you. “You want to interview me. I hope you will not label me a nautch girl. Before talking to me you must understand my art. Then I will tell you all you want. Even today people remember me with respect”, she said. 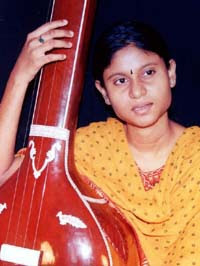 Zarina Begum’s musical journey began as a child. Her earliest memories are of being locked inside a cupboard by her younger brother, “Sister, you may sing now,” he would say. “And I would start off, from inside the cupboard, trying to sing my best. Outside, the children would clap. Her eyes mist over. “I sat beside my father in the rickshaw, huddled in my black shawl with which I had covered myself. I was very nervous. We passed a large gate and then came to a huge hall. There was a white chandni and masnad prepared for us. When I sat down on the floor all I could see in front of me was a huge gathering of very rich looking people, mostly men. They wore fancy clothes and jewels and I felt a thousand eyes were piercing into me. I was so scared that I just closed my eyes and concentrated on my singing. I did not let my father down. After I finished, they heaped rewards on me. I just bent low and kept doing salaam. My father was very proud of me that day,” she says. It was at one such mehfil that Zarina met her husband, Qurban Hussain. “Don’t go by the way he is now. My man was quite a sparkler in those days,” she says coyly, I was wanting for a tabla player and he volunteered to play for me. We’ve never been separated since. His fingers worked magic on the tabla,” she says. With few calls for mehfils nowadays, it is left to their lame son Ayub to play the tabla and dholak with local qawwals and help run the house on his meager earnings. Her daughter Rubina still awaits her rukhsati for want of proper dowry. “How can I send her off from my house in just the clothes she wears?” Zarina laments. Once the star of many a glittering mehfil, Zarina has only tales from the past to relate now – of royal mehfils with an inebriated Maharaja swaying to her thumris, zamindars requesting her to sing a fast song, to enable them to do a quick twirl with their English memsahibs… of lavish dinners and elaborate feasts. But it’s been a long time since she’s attended any of these. Rubbing her fingernail against the falling plaster on her walls, she sighs, “All that is in the past now. There have been no calls for me for nearly a year. I wonder what curse has befallen the people of this city. Have they lost their taste in music or do they not throw parties any longer? It’s not easy managing the finances without a regular income” she quips. “Will you tell them, Zarina Begum still sings, maybe they will call me then,” she says, her eyes full of hope.